Medieval Lionheart Swords for sale are 33 ½ inches in all. The Lionheart is inspired by real 12th and 13th century medieval swords that were used by crusading European knights. This modern version features a sharp and functional 27 inch high carbon spring steel blade. They have a peened wheel pommel, cruciform-hilt style and a slightly down-turned curved bow-tie style guard. The 6 ½ inch Makassar ebony wood handle is wrapped in black leather. 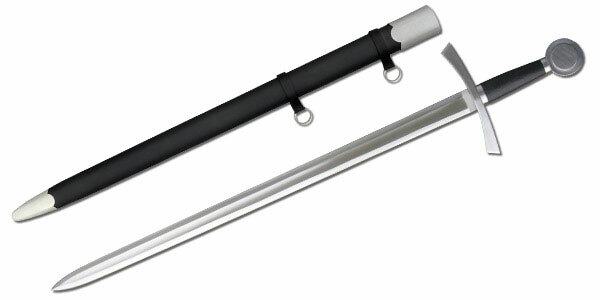 They include a matching black leather scabbard and weigh 2 ½ lbs. Buy the medieval Lionheart Swords for $219.99.